I’m an environmental activist, or used to be, and the town where I’m based went for Obama by 80% percent in the last election. To the people of Oso, I'm the guy (or it’s someone like me) who stands up in their county planning commission hearings and City Council meetings armed with charts and graphs created by professors at the University of Washington describing how they must regulate logging practices or farming practices or housebuilding practices and in other ways limit their rights as property owners in order to serve a greater good of clean air and water and livable habitat. And it drives them nuts. That’s not what I’m apologizing for. My political differences with the people of Oso are real and important. 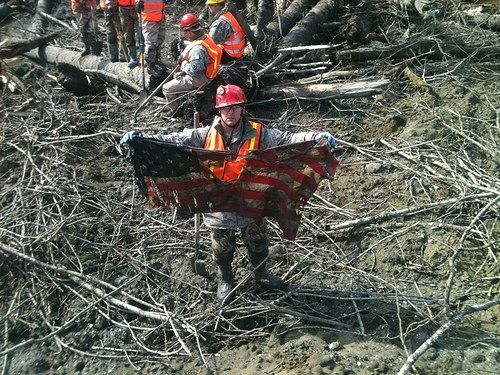 Like many others I've been stunned by the pictures of the disaster in Oso, which may end up the most lethal landslide in US history, It’s the pictures of the people that move me most. Local people, loggers, pushing past the Do Not Enter barriers to dig for their family and friends, no matter the dangers of still-moving earth and ignoring the county bureaucrats telling them to stop. Then these same men coming back with their big yellow machines to clear more rubble and find more bodies. These guys went in because they had to, because they had the courage and skill to go in and because it was the right thing to do. I see the pictures of children’s shoes and mud-covered family Bibles and hear of a brother gently lifting his sister’s crushed body our of her car. I see pictures from Oso of the fierce love of family and connection to community. I feel a deep sense of thankfulness and pride--and awe--that human beings rise to these horrible tests so magnificently, whether it’s the survivors of Oso in 2014 or the New Yorkers who supported each other so well on 9/11. I honor the people of Oso for their courage and compassion and sensibility. I’m also a mountaineer, with deep experience with these mountains and their dangers. If I thought I would not just get in the way, I’d be up there helping the people of Oso dig. If they’d have me. I cringe to remember all the stereotypes I’ve collected of small town mountain folk—lucky to have gotten though high school, barely traveled, lovers of stock cars and guns, not smart enough to figure out Tea Party lies, and on and on. Which makes me wonder: Why should it take a disaster to make this confluence of values so evident—for me, for any of us? Why, since we share so much at a deep and personal level, is it so hard to share much of anything at a political level? I’m a hardened political pro and I’m not looking for rosy miracles; I understand the differences between people like me and people who live in these rural communities. But I don't understand why we can never seem to find the courage and caring to eliminate the divisions between us that are senseless and cruel and deal with more honesty and compassion with those that aren’t. Next election my votes will probably cancel out some votes from Oso. But next time I’ll remember the people of Oso and I’ll tip my hat in respect. That’s a beginning.